As soon as we released our Mid-Year Project Report 2006, whith the news about a new species of sole from KwaZulu-NAtal, our Fish-Watchers went searching for the fish to photograph it! Emma Booysen, photographer and Ph. D. student, got the first image ever of a living specimen from Aliwal Shoal! WOW! This new dwarf sole, Aseraggodes heemstrai, has just been described by Jack Randall (Hawaii) and Ofer Gon (SAIAB, Grahamstown) using 5 specimens from Aliwal Shoal, 2 specimens from Sodwana Bay and one from Protea Bank. It was named after Phil Heemstra who collected most of the specimens over the last decade as part of the Fishwatch programme using funding from SAPPI. 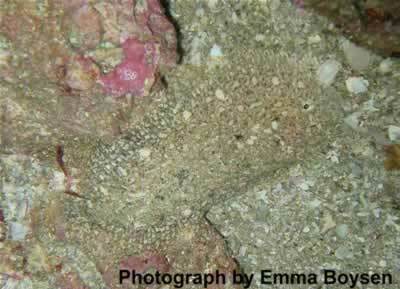 The species has been found on sand near rocky reefs to depths of 39 m and at present is only known from South Africa. The fishes in the Family Soleidae, to which the dwarf sole belongs, have both eyes on the right side of the head (the eye on the left side of the head moves over to the right side during the course of the development of the larva). Soles can change their colour pattern to match the substrate and are benthic, sedentary fish. Unlike some other soles, Aseraggodes species have no pectoral fins. A. heemstrai, was previously misidentified as Parachirus xenicus. This dwarf sole attains a size of 85 mm SL. Many thanks Emma, for sharing your WOW! PHOTO. Go back and see our Past Wow! photos!